MANSFIELD - Rush fans are a funny bunch. More than a quarter century after the rock trio peaked, its admirers remain staunchly loyal. They still listen to "2112" and "Moving Pictures," though most likely alone and in private, for fear of enduring ridicule from those who just don't get it. And when the band comes to town, they show up in force. Thousands of them descended upon the Comcast Center Sunday night, despite the fact that the three-hour concert competed with Game 5 of the Celtics-Lakers series. And they loved every minute of it, thrusting skyward their hands with index finger and pinky raised, displaying the universal sign for "I approve of that power chord." It's a shame the band didn't reciprocate the love. The music itself was fine, even if the mix was a bit muddied; rock bands will trade clarity for volume every time. Newer songs like "Far Cry" and older ones like "Digital Man" and "Spirit of Radio" sounded pretty much like they do on the records. Live replication is, unfortunately, what crowds expect from rock concerts these days. But Rush fans are a limited number in 2008. Few in Sunday's crowd appeared to be younger than 30, unless they were children dragged there by their parents. One could safely guess that most of those who bought tickets also saw the band last year in Mansfield. So why wouldn't the band mix things up a bit? The set list was essentially unchanged from a year ago, as were the video sequences and other visuals, including the three cases of rotisserie chicken that appeared to cook onstage for no apparent reason. Why not give the people more for their hard-earned money? OK, yes, the band technically is still on its "Snakes & Arrows" tour, but it owes its fans more than simply going through the motions a second time around. Rush's musicianship can hardly be criticized. 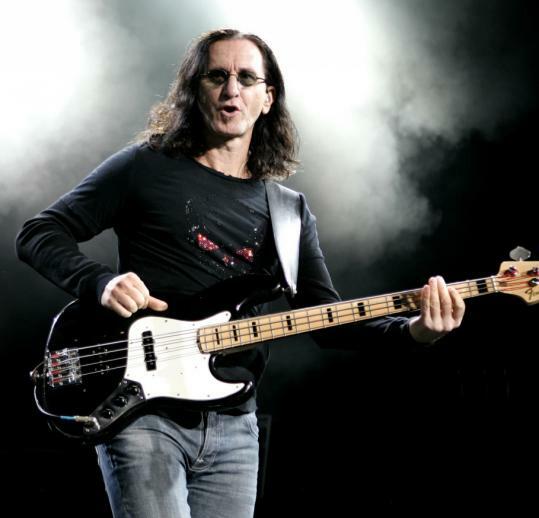 Geddy Lee was a dynamo on the bass, and his vocals were in fine form, having lost little of their edge after all these years. Guitarist Alex Lifeson turned in some blazing solos that he has played from memory more times than he can count. Drummer Neil Peart - always the crowd favorite - smacked his huge kit around with aplomb while betraying precisely zero emotion. The trio's chemistry during an instrumental portion of 1980's "Free Will" was so infectious that it prompted a fellow in front of me to raise both of his cups of beer above his head and shout "woo hoo!" not once, not twice, but six times. See, these fans, they're just so appreciative, so loving. So how about something new and different from Lee, Lifeson, and Peart on their next swing through town? When they announced this year's tour and said there would be some surprises, they really meant it. Surprise! It's the same show as last year! Discuss Did you see Rush in concert? Your review?